We all love our Rottweilers, but a tough part of being a pet owner is dealing with disobedience. I would like to focus on the different ways to deal with disobedience, some possible causes of their bad behavior, and how to correct these problems in a humane manner. This you may not like to hear, but your dogs disobedience is a reflection of your training or lack of it. A dog does not train itself, and if you do not teach your dog right from wrong, they will continue to make the mistakes you are allowing them to make. As the owner of the dog, you must take responsibility and fix these problems. But bad behavior must also be addressed properly. Whether it is incessant barking, chewing up or jumping on your furniture, or acting aggressively, it is your job as the owner of the dog to discipline them properly. Why is My Rottweiler Disobedient? There are a number of reasons why your rottie may be acting out. The number one cause of disobedience is simply poor, or misguided training. Or lack there of completely. If you do not teach your dog how to behave properly, they will not know how to act properly. Spoiling your dog does not help either. It is perfectly fine to give your dog treats for a job well done, but make sure they are a reward for good behavior, or they will think they get treats whenever they want. 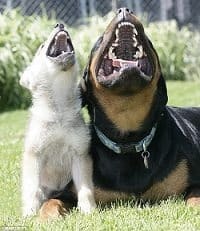 Fear is another reason your Rottweiler may be acting out. If your dog is fearful of you, he will not respect you. It is important to never hit or scare your dog when they have done something wrong. This only causes your dog to become fearful. The dog will not listen to an owner who is mean to them. They will listen to an owner they feel loves them, though! There are many ways your dog can disobey you. You must understand first what is good behavior and what is bad behavior. Everyone’s idea of a good dog is different, but there are some basic forms of disobedience, especially when dealing with the strong headed Rottweiler. Barking incessantly to get what they want is very common. If the will not stop barking, it is best to ignore them until they are quiet. Then, if they want to play or go outside, give them attention once they have calmed down. This can be hard to do, but if you need to invest in earplugs, it will be worth it to teach your dog how to behave. Chewing on furniture or any item that is not a dog toy is not allowed. 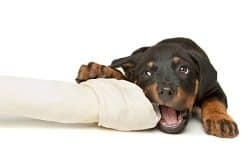 If you catch your Rottweiler in the act of chewing on items they are not supposed to chew on, you must immediately discourage this behavior. You must teach them the meaning of the word “no” and not let them get away with misbehavior. 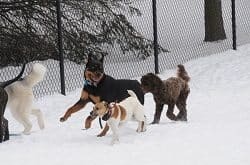 If this means that you must keep them in an environment where they cannot get to your furniture or personal items, then you must find somewhere for them to stay while not being supervised that is doggy­proof. Rottweilers are prone to aggressive behavior. This mainly happens with poor breeding, where the breeder is either breeding the dogs for aggression or are not qualified to be breeders. This means it is very important to socialize you Rottweiler from a very early age. They can also be aggressive towards other animals as well. If you have a family pet, it is very important that you socialize them immediately, or there could be problems in the future. Always discourage this behavior. Our Rottweilers are not purposely trying to be disobedient, but sometimes we need to take some responsibility ourselves. We need to look at why the dog is misbehaving. Here are some things that can cause a Rottweiler to behave badly. Rottweilers are very energetic. They need lots of room to run around and lots of attention. This means you must find time to spend with your Rottweiler. You must take them on walks, play with them in the yard, and give them attention in your home as well. They need to run off all that energy so they can be comfortable and happy. Rottweilers are an aggressive breed. They must be taught from an early age that other dogs, people, and animals are friends, not enemies. This means early socialization is key. Rottweilers get bored. They don’t mean to misbehave, but when you are at work all day and they are stuck in the house with nothing to do, they tend to chew up your belongings because they are bored. This behavior must be halted at an early age. You must find a safe place for your Rottweiler to stay while you are at work until they can be trusted to not chew up all your things. Also, it helps to make sure you have toys for them to play with in your absence. So, your Rottweiler is not trying to be a bad dog, they just may not know how to be a good dog. It is your job to give them the training they need. And patience is the key. Through positive reinforcement, your Rottweiler will happily do what it takes to make you happy, but you must teach them how to be a good dog.